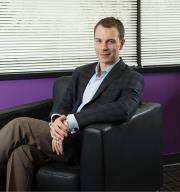 Joe Keeley, president and CEO of College Nannies and Tutors. The trouble for Harry was math. His parents brought him to College Nannies and Tutors (CNT) in Edina, where he received math tutoring from the time he was in middle school through his high school years. “I left feeling accomplished, like ‘I get it now,’ ” Harry Aslesen says of his weekly sessions. Now a senior marketing major at the University of St. Thomas, the study skills he gleaned at CNT remain with him today. “It helped me maintain my [college] grades and be successful academically,” Aslesen says. While his tutors were certainly proficient in math, there was another important part of the equation—their age. CNT typically hires college students, recent graduates and those committed to teaching/mentoring children. By pairing students and tutors who are relatively close in age and experience, CNT-Edina owner Laura Davis says it produces a “we’re in this together” dynamic. After an exhaustive interview process, CNT facilitates “matchmaking” to find the best nanny-family fit, Davis says, adding that staff receive ongoing professional development. Joe Keeley is no stranger to coming full circle. He had just completed his freshman year at St. Thomas in 2000 when he answered an Edina family’s ad for a hockey-playing summer nanny for their 7- and 9-year-old boys. “What the parents were looking for was a holistic view, not just a babysitter,” he says. Keeley spent the summer supervising the boys, ferrying them around town, coaching one of his charge’s hockey teams and serving as a mentor. After work, Keeley and his college buddies would get together, exhausted from their workdays. The difference—his friends spent their days working construction, digging trenches for pools, while Keeley spent the day “in a pool swimming with the boys,” Keeley says. Their reaction: Get us a nanny job. During a pickup hockey game, Keeley received some good-natured ribbing about his job from the other adult players. He explained the scope of his job was equal parts nanny and mentor, allowing him to have a positive impact on the kids’ lives. Their reaction: Get our families someone like you. The fundamental concept of supply and demand lit up the proverbial lightbulb in Keeley’s mind, and he developed CNT while working on his entrepreneurial degree at St. Thomas. CNT was incorporated in 2001, and Keeley received the 2003 Global Student Entrepreneur Award the year he graduated. When Keeley asked a judge why he won, the judge responded by noting that [Keeley’s business model] is something that fills a legitimate need across the country. And so, Keeley’s summer job has blossomed into 85 CNT locations in 27 states, staffing 5,000 nannies and tutors with the help of 50 franchise owners. Davis was the first to join the company as a franchise owner after reading about Keeley and his concept in a business periodical. They teamed up and opened an Edina location in 2004. Shortly thereafter, it moved to the current space on West 50th Street. “We wanted that ‘local part of your community’ feel,” Davis says.